An immediate objective of the STBA is to focus on the risks and benefits associated with generic approaches to repair, maintenance and retro-fitting of traditional buildings. We establish advocacy routes to key decision-makers involved in the sustainability of the built environment, including Each Home Counts, in order to help inform policy development relating to traditional buildings. We have completed a gap analysis of current research on performance of traditional buildings, including an analysis of expertise and skills, in order to inform future research and policies. Regular Policy Bulletins are sent to our members. A copy of our previous (April 2018) Bulletin can be seen here. We have prepared a Policy Mapping document that we update periodically. Energy Performance Certificates (EPCs) are increasingly being used in UK policy as a means of driving the energy efficiency of the existing building stock. However, there are significant problems with this approach. The report provides an overview of the key issues, constraints and opportunities surrounding EPCs, identifying ways in which they could be better aligned with the ‘whole-house’ approach to retrofit developed by the STBA and recommended in the Each Home Counts report. 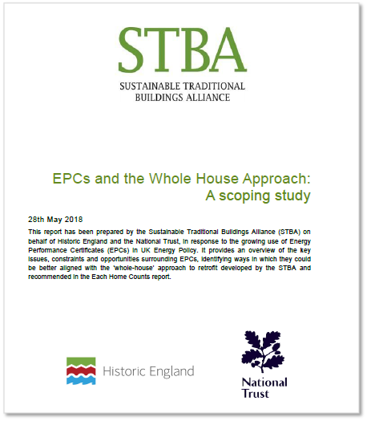 This scoping study has been prepared by the Sustainable Traditional Buildings Alliance (STBA) on behalf of Historic England and the National Trust. The scoping study can be downloaded here. As part of the STBA's ongoing dialogue with the government on building assessment and the whole-house approach, we have responded to the consultation on Energy Performance Certificates which closed on 19th October. Download the STBA response to the EPC consultation here. A publicly available standard for retrofit is under development at BSI. PAS2035 will cover the critical survey and design elements which had previously been included in PAS2030 - which is itself being revised and will focus purely on installation. We are delighted that PAS2035 has clear objectives including the avoidance of unintended consequences, the protection and enhancement of cultural and architectural heritage, and improving comfort, health and wellbeing. A wider stakeholder consultation has been held and STBA has responded in support of the draft proposals. From April 2018 it will become illegal to let out a property with an EPC rating worse than “E”. The PRS guidance for non-domestic properties has already been published and is available here. The Domestic guidance is available here. The STBA email to BEIS regarding the original proposals for Domestic PRS Guidance can be downloaded here or by clicking on the icon below. In 2017 the STBA welcomed the Bonfield Review’s acceptance of a whole-building approach to retrofit and the need for training/education and capacity building. We were also pleased to note that the Review recommended a bespoke and thorough assessment of each property prior to retrofit as well as recognising the need for some robust monitoring of retrofitted buildings. There is a commitment to make this information widely available and proposes an information hub - something that the STBA has long been championing. However, the STBA was concerned that there was no focus on the required differences between treatment of older (solid-wall) buildings and modern (cavity-wall) buildings. To avoid repeating the mistakes and unintended consequences of the past, knowledge gathering is essential – both from existing research and new, real-life pilots of a full range of property types, retrofit measures and materials. Subsequent amendments to relevant guidelines and regulations need to be put into place prior to any widespread roll-out of retrofit measures. These should include the need for repair and maintenance – and the removal of any existing work that is harmful to the building fabric – prior to embarking on new measures. Other items highlighted in our response to the Review included the opportunity to achieve a wide range of social, economic and environmental goals. Retrofit can be used as a method of moving the long term unemployed back to work and helping deprived communities take pride again in their environment. With the correct approach, we can avoid limited, short-term benefits for industry and an illusion of energy efficiency. The STBA involvement with Each Home Counts continues into its Implementation Phase where there are a total of 15 working groups The STBA is represented on 4 of these groups, namely: Standards, Training, Building Fabric & Technology, Design & Installation. The Standards group is one of the more advanced as it has already commissioned and received a report on existing standards together with a gap analysis indicating where standards may be lacking. As traditional buildings constitute perhaps 35% of those that need to be improved, we continue to apply pressure in all these groups to ensure that the very specific needs of traditional buildings are taken into account. The STBA response to the original Each Home Counts consultation can be downloaded here or by clicking on the icon below. STBA moisture risk assessment and guidance was commissioned by DECC in response to a growing realisation that traditional moisture risk approaches are inadequate. The guidance - by STBA's Neil May and Chris Sanders - has now been published as a white paper. Moisture in Buildings: an integrated approach to risk assessment and guidance, this is available to download via the bsi website. Heat loss in building elements, where using SAP defaults and standard heat loss calculations (BR 443) may be inaccurate and can result in overestimation of the thermal conductivity of solid walls. STBA paper - Conventions and standards that govern the understanding of heat loss in traditional buildings. Regulatory targets and thermal assessments do not take sufficient account of unavoidable thermal bridging or of the risk to fabric and human health of reducing heat flow into walls beyond a certain limit. We establish advocacy routes to key decision-makers involved in the sustainability of the built environment, in order to help inform policy development relating to traditional buildings. The STBA is also seeking to influence the performance/ delivery of retrofit projects on traditional buildings by working with leading owners of building stock to measure and improve the interventions adopted. So far this work has included work for Blackpool Council and Bristol City Council. This call for evidence by the Department for Business, Energy & Industrial Strategy is to improve knowledge of stakeholders’ views on the Green Deal Framework, and whether there is scope for changing the Framework so that it can better support current and future needs. They sought views on the Framework as a whole, all the elements within it and on factors that may warrant changes to it. The STBA response can be downloaded here or by clicking on the icon below. This call for evidence by the Department for Business, Energy & Industrial Strategy outlines a range of barriers to investment in energy efficiency on both the demand and supply side. It invited views about the role of government in overcoming barriers and stimulating the market through more direct interventions. Finally, it considers a range of potential solutions, many of which have been advocated by businesses and industry representatives. This consultation sought views on how to make the process of home buying and selling cheaper, faster and less stressful. The Energy Company Obligation ECO3 Consultation consultation document can be downloaded here. The section on treating solid wall homes can be seen from page 32. The STBA will be responding. If you would like to communicate with us about this, please contact Nigel Griffiths at nigel@stbauk.org. The government is seeking views on Energy Performance Certificates (EPCs) - a tool that BEIS considers key in promoting energy efficiency improvements to buildings. This consultation is open until 19 October 2018.